President Obama says the Islamic State isn’t Islamic. The Washington Post says “Americans disagree” and has nifty charts and polls to prove it. Daniel Pipes disagrees too. The Middle East scholar says ISIS is “100% Islamic”. Dennis B. Ross says, in the NYT, that ISIS is Islamist and “Islamists are not our friends”. What the Islamists all have in common is that they subordinate national identities to an Islamic identity. Peggy Noonan (click The Genocide of the Mideastern Christians – WSJ) says the Islamic State is “de-Christianising the Mideast where Christianity began”. An estimated two-thirds of the Christians of Iraq have fled that country since the 2003 U.S. invasion. They are being driven from their villages in northern Iraq. They are terrorized, brutalized, executed. This week an eyewitness in Mosul, which fell to Islamic State in June, told NBC News the jihadists were committing atrocities. 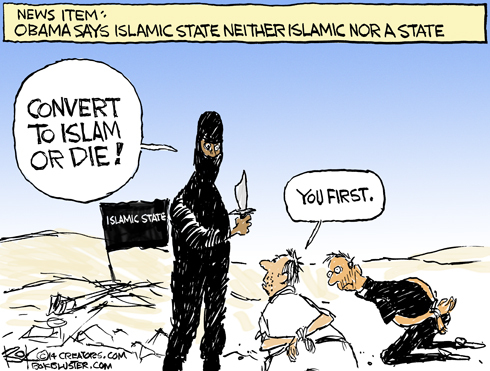 In Syria, too, they have executed Christians for refusing to convert. Update: John Kerry is putting “the real Islam out there”. Andrew Wilson in The American Spectator calls Obama’s claim “the grossest nonsense”. Under Mohammed, Islam began as a religion of conquest. A commitment to wage jihad or holy war and to “smite the necks” of unbelievers has been part of Islam from the earliest days. In the 100 years following Mohammed’s death in AD 632, when Islam was still confined to the Arabian peninsula, Arab armies spread the faith as far west as Spain and as far east as northern India and the frontier of China.